Afghanistan’s presidential elections may have caused an increase in poppy cultivation. A couple weeks ago, we discussed the recent data from the United Nations Office of Drugs and Crime (UNODC), which showed that Afghanistan’s chronic problem with poppy cultivation showed no signs of abating. In fact, the latest figures show that poppy cultivation, as measured by total area used to farm the crop, reached an all-time high in the country. A total of 224,000 hectares of Afghan land — a 7 percent increase from 2014 — is being used for poppy cultivation in 2014. This was somewhat puzzling considering that Afghan poppies are at the root of the global illicit opium trade where demand has stagnated and prices have dropped, according to the New York Times. So why did opium cultivation continue to thrive in Afghanistan? The answer, at least according to comments made by U.N. officials regarding the recent UNODC report, is Afghanistan’s presidential election. According to Jean-Luc Lemahieu, an official with UNODC, the presidential election process naturally led to a massive surge in demand for funding. “That funding is not available in the licit economy, and that money has to come from somewhere, so they turned to the illicit economy,” notes Lemahieu. With a somewhat lacking regime of law enforcement governing political campaign contributions, Afghanistan’s presidential elections led to a surge in domestic demand for poppy cultivation indirectly according to the UNODC report. Additionally, the report notes that programs focused on opium crop eradication actually decreased by 63 percent between 2013 and 2014, with the bulk of the decreases coming in provinces where active eradication efforts were previously underway and moderately successful. 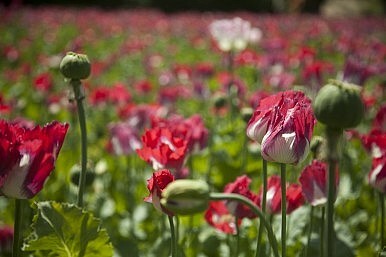 Opium production and cultivation declined until about two years ago. The report notes that part of the reason these eradication efforts decreased is because of active attacks by the Taliban (which taxes poppy farmers in some areas of the country) and others with stakes in poppy cultivation against Afghan security forces charged with eradication. Additionally, given that provincial governors were charged with leading eradication efforts and are political appointees of the president, they may have lacked sufficient political incentives to implement these programs given the impending change in government. The report also suggests that ethnic politics could be partly culpable for discrepancies in the effectiveness of eradication efforts. The most effective eradication program took place in the northern, predominantly Tajik province of Badakhshan. Meanwhile, the UNODC report found that 89 percent of all Afghan opium cultivation took place in the country’s predominantly Pashtun southern and western regions. If the election hypothesis is correct and the increase in poppy cultivation is due to a demand for domestic election funding despite a stagnating global market for opium, poppy cultivation should decline going forward. The new Afghan unity government has shown more resolve than its predecessor in tackling Afghanistan’s drug cultivation problem; for example, it arrested three judges, who have been charged with corruption, for enabling the prison release of a U.S.-wanted drug trafficker. The real test of the Ghani administration’s commitment to tackling this issue will be its effectiveness in reviving eradication efforts. All three of President’s Ashraf Ghani’s female cabinet picks have been rejected by parliament.